We specialize in manufacturing customized Granite, Marble, Onyx and Quartz products for kitchen countertops, vanity tops, fireplaces surroundings and furnitures. Get extra 25% off on Stainless Steel Kitchen Sinks. 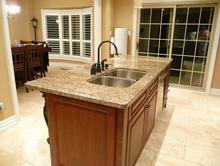 We would like to thank you for an excellent job on our new granite counter tops. The overall result was beautiful and we indeed love it. You are so very helpful during the process of selecting the material and working with us patiently. We appreciate your effort. Robert, thank you for doing the job so quickly. so far we are more than pleased.